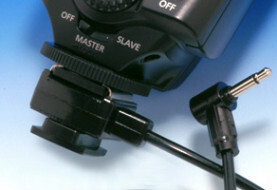 This unique cord / mount will attach you Pocket wizard electrically and doubles as a mounting device. Many photographers want to keep their Wizards secure while connected to the pack. Velcro to the pack is undesirable because the Wizard is lower than the top of the pack which makes it more susceptible to interference. Velcro to the side of the pack is undesirable because the Pocket Wizard is lower than the top of the pack which makes it more susceptible to interference. This Cord allows you to slide your Pocket wizard Receiver or Multi Max into the shoe ( cold shoe) of this adapter , plug the Miniphone into the top of the Wizard , then plug directly into your power pack. Now you have a seamless solution to the connecting / mounting of the Pocket Wizard. 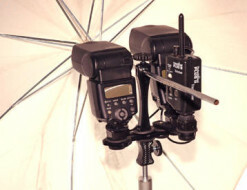 This solution makes Pocket Wizard mount in the same way the Microsync Digital radio mounts. Just plug in , no wires to think about. Please note: These adapters are unique one of a kind items. 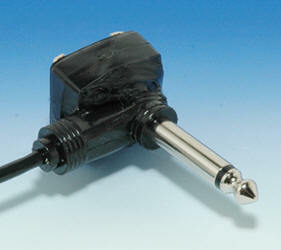 We manufacture them on a one by one basis fusing hot plastic between the shoe and the plug. Therefore there may be slight variations between each adapter. These adapters are in effect prototypes and there may or may not be imperfections in this process. These variations in no way affect the performance of this adapter.